Sea Water Mill Water Craft Carriers MP-SPS ShepHydro . 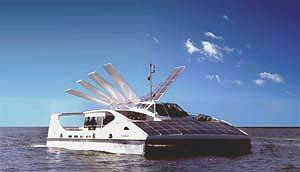 The Desal Watercraft Carrier is, but is not limited to, a large scale 3 or more tiered portable floating collector of wind wave tide and solar energies with battery and reverse osmosis desalination plant on-board. Gathering power, storing power and making water for cities. Sustainability at this stage costs a little extra but is considered cheaper in the long environmental run. The management of waste in a renewable cycle is less - there is likely to be little waste because that's what renewable is, the fuel re-news itself. The sun is the best example, we can use it over again and again. It is a direct saving not to have waste to clean up or fuel to find. The massive energy and cost figures is not my expertise but the common thread of new "component parts" is efficiently utilising the waste energy at each stage. The breaking action in an electric car is stored in a battery and re-used to accelerate. The up and down action on the waves creates a vacuum in the air tight pressure piston pump. Sourcing energy from all 4 directions at once, solar wind wave and tide - is a broader energy spectrum. Is manouverable and can seek best position much as any sailing ship turns to the wind. Only a sea worthy craft can experience all 4, tide wave wind and solar exposures. Managing waste energy by improving efficiency with clever ideas. The efficiency of a floating desalination plant requires the other energy hungry components to compliment the 97% efficient PX Pressure Exchanger and the VRB Redox Flow Cell, an 80-90% re-chargeable scaleable non-toxic renewable battery. The Solar Sailor wings saves some 50% comparative fuel costs. These devices each save energy, they are tools of sustainability. A synergy focus of energy recovery will make it cost efficient. The energy that is needed to sustain this comes at a higher cost, but the ongoing fuel costs are NIL since we're using renewables, and there is no clean up cost or waste removal or waste disposal and far less greenhouse gas. Figuratively speaking, Desal can leave on the tide and return with a full re-charge and load of fresh water on the next - without actually leaving the mooring. The futuristic ability to seek out the best spots is critical to returning with a full load, and like fishing there's a catch - but with computers and satelites we can follow in the un-maned footsteps of hurricanes. We could remote-control and literally catch enough storm to charge the energy systems on-board. To save on costs todays would be stationary requiring a team of tug-boats to get around. After all, the job is a portable desalination plant. Charge the battery over night - first time only. Battery accounts for mobility and travel distance from home. Daily routine governed by the tide wave wind and sun direction. Able to desal at Port. Able to desal at Sea. Seeking and Tracking - locate and find optimum 24 hour day wind wave solar resource. Massive - able to withstand storms and/or relocate. Massive - able to charge all systems within storms and return home. Energy Collector - gather energy from multiple wave wind tide and solar sources. Battery Storage - save the energy in electrolytic and hydro tanks for later recovery. Sea Water Desalination - on-board desalination. Water Storage - on-board water storage. Electrolytic Storage - on-board battery storage. Return to Base - when all systems are charged. Discharge fresh water - energy hydro recovery. This hydro energy saved could pump fresh water into the city water system. Conversely the U-pressure equilibrium pump-tide-leveler could. Portable - can sail to next destination. It's not in my backyard. Managing waste energy by improving efficiency with clever ideas. A synergy focus of energy recovery will make it cost efficient. Too much trouble to go through just to make water... but I'll wait for the energy figures verses cost. 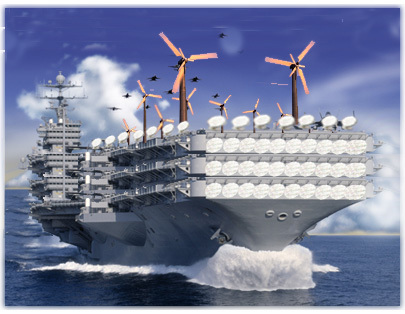 17 Jan 2007 - - Solar Sailor proposes to ship water from Tasmania to Sydney in Solar-Wind-Electric SUPERTANKERS ! When the ice on the land melts and falls into the sea - watercraft carriers with on-board ice-water processing should collect, process and fill "many floating water containers" to transport premium "ice-water" and deliver to ports around the world as drinking water...there's probably even a profit in it! "Get on board a cleaner world"
Solar Sailor is the world's first commercial passenger vessel to be effectively fuelled by wind and sun-either separately or in combination. A $1 million grant, received by Solar Sailor Holdings Pty Ltd under the Renewable Energy Commercialisation Program, was a key component in achieving the manufacture of the world's first commercially viable passenger vessel powered by dual renewable energy. Solar Sailor-a 21 metre, 100 seat, multipurpose catamaran- is the brainchild of a medical practitioner living at Ulladulla on the south coast of NSW. It is the first vessel to be efficiently fuelled by the dual energies of the wind and sun and is now operating commercially on Sydney Harbour. A reliable supply of fresh water in urban areas is becoming a growing problem around the world. Aquatankers using proven Hybrid Marine Power technology offer a compelling solution with outstanding benefits. The concept involves a series of supertankers specially designed and constructed for the carriage of potable water. The water is transported onto land through small, offshore facilities known as Single Point Moorings (SPMs). Using our unique Solar Wing sail with solar cell array technology reduces fuel consumption and emissions by nearly 50% on the voyages compared to the conventional tanker of this size and hydrodynamic characteristics. Sydney-based sustainable technology firm, Solar Sailor Holdings Ltd propose to build a fleet of solar-powered tankers which could deliver water from the Kimberley to Perth for less than $1 a kilolitre. This compares favourably with the Water Corporation's estimate of $1.11 a kilolitre for water from its proposed desalination plant. The former prime minister said the supertankers were environmentally friendly and economically viable. "Theoretically there's no reason why this could not be used in Sydney - the concept of bringing the water is very straightforward," Mr Hawke said. Dr Robert Dane, CEO of Solar Sailor welcomed Hans Martin Weiss, CEO of Mithril to Sydney on 8th August 2005. Mr Weiss was welcomed during a sunset cruise aboard the Sydney Solar Sailor on Sydney harbour. Dignitaries present included the Hon Bob Hawke AC, Chairman of Solar Sailor and representatives from the various sponsors and supporters of Solar Sailor. Mithril GMBH, a German investment company has made a strategic investment of $1M in Solar Sailor Holdings Ltd of Sydney, Australia. Solar Sailor is the world leader in Hybrid Marine Power (HMP), a revolutionary technology set to transform the way we travel on water. SOLAR SAILOR HOLDINGS LTD is proud to announce US subsidiary company UOV LLC (uovehicles.com) based in Virginia has received a Phase 1 US Navy grant for the development of its patented unmanned ocean vehicles (UOV’s). The automated and networked UOV’s will be used for military and coast guard purposes, and have commercial and oceanographic applications including tsunami early warning systems. SYDNEY'S water crisis could be solved using the same environmentally friendly aquatankers being touted as the solution to Perth's water needs, former prime minister Bob Hawke said yesterday. A FLEET of supertankers could be used to carry 50 billion litres of water 2300km from the vast untapped supplies in Western Australia's Kimberley region to Perth, in a bid to meet the city's desperate need for water. How to desalinate 30 million litres per day of potable water without pollution!! The evolution of technology is speeding up.